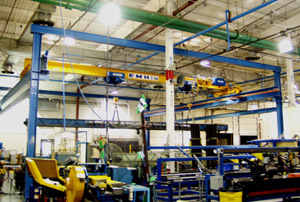 EMH Overhead Cranes in the Auto Industry | EMH, Inc. The freestanding structure of this NOMAD® bridge crane system allows it to be positioned strategically without support from the building's steel. Two three-ton hoists and a radio control are used at this Midwestern auto parts manufacturer.